RICHMOND - The Richmond Flying Squirrels brought the tying run to the plate in the 10th inning, but failed to make a comeback in a 8-5, extra-inning loss to the Bowie Baysox in front of 5,301 fans at The Diamond on Tuesday. Bowie (2-3) wasted little time breaking the 5-5 tie entering the 10th and final inning. On the first pitch of the frame, Ryan McKenna drove a fastball from right-hander Melvin Adon (Loss, 0-1) over Levi Michael's head in center field for a triple to bring home the placed runner Sean Miller. Two pitches later, Rylan Bannon singled to bring in McKenna to give Bowie a 7-5 extra-inning lead. Then, after a groundout moved Bannon to second, he scored on a single from Anderson Feliz, to put the Baysox up 8-5. Jacob Heyward walked to lead off the 10th inning for Richmond (3-2), putting runners on first and second to bring up Jonah Arenado as the tying run. However, Tyler Erwin (Win, 1-1) retired the next three batters to secure the win. The Flying Squirrels got on the board first with two runs in the second inning. With one out, Heyward and Arenado hit back-to-back singles to put runners on first and second. After a passed ball allowed Heyward and Arenado to move to second and third, Michael smacked a two-out, two-RBI single up the middle to give Richmond a 2-0 lead. After facing the minimum through the first three innings, Richmond right-hander Alfred Gutierrez ran into trouble in the fourth. Following a leadoff walk to McKenna, Gutierrez allowed an RBI double to Bannon, trimming the lead to 2-1. Then, a walk to Yusniel Diaz and a double by Feliz brought Bannon home, tying the game at 2-2. Next, with runners on second and third, Ademar Rifaela hit a sacrifice fly to right field to give the Baysox the lead. Bowie collected its final run of the inning when Preston Palmeiro dropped down a safety squeeze bunt to bring home Feliz from third. The Baysox added a run in the fifth against right-hander Connor Overton. With one out and a runner on second, Bannon and Diaz hit back-to-back singles to bring in Miller and put Bowie in front 5-2. 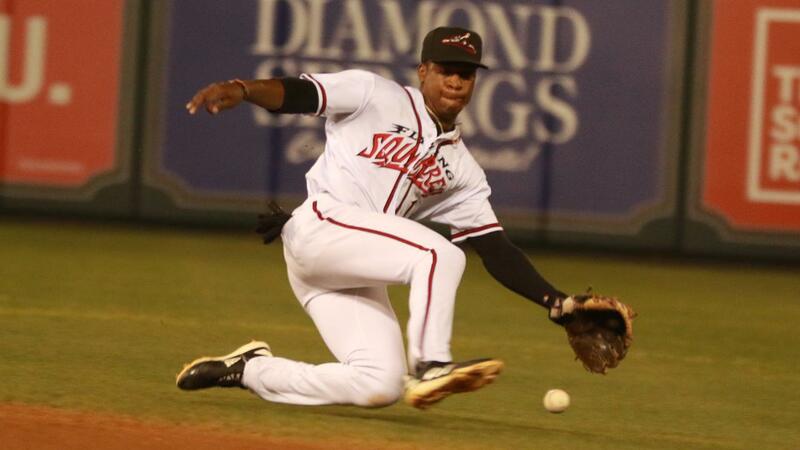 The Flying Squirrels tied the game in the seventh when Pedro Araujo walked Michael, allowed a single to Jalen Miller and walked Ryan Howard to load the bases with nobody out. Next, Chris Shaw worked a walk to force a run to make it a 5-3 game. Following a pitching change, Brock Stassi brought home the second run of the inning with an RBI groundout. The Flying Squirrels evened the score on the very next pitch when Howard scored from third on a wild pitch. Two scoreless innings apiece from Richmond left-hander Fernando Abad and Bowie right-hander Zach Pop helped send the game to extra innings. Richmond's nine hits and five runs both mark season-highs for the team in 2019. The Flying Squirrels' opening homestand concludes on Wednesday against the Bowie Baysox. Left-hander Bruce Zimmermann toes the rubber for Bowie against Richmond right-hander Logan Webb (1-0, 0.00). First pitch is set for 10:35 a.m., and gates open at 9:30 a.m.
Wednesday marks the first of two games designated for school kids throughout Central Virginia at The Diamond this season. The Education Day features live music from children's performer Chris Campbell, a pregame player Q&A session, demonstrations and more, presented by Carrabba's Italian Grill.